Yates' view: Is it time to tie Luke down on long-term deal? Saints have moved swiftly in the last few weeks to secure the future services of three big guns. Skipper James Roby has penned a deal, which runs to the end of 2021, while team-mates Tommy Makinson and Jonny Lomax will be on board until the end of 2022. It's a reflection on the current team spirit among the players and their insatiable appetite to bring more silverware to the Totally Wicked Stadium and at the same time erase the bitter memories of defeat in last year's Challenge Cup semi-final against the Catalans Dragons and the subsequent setback to Warrington Wolves one step away from the Old Trafford Grand Final. 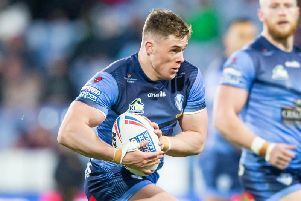 Alex Walmsley - who missed most of last season through a serious neck injury - is also under contract until the end of 2022 and his partnership with fellow prop Luke Thompson is set to strike fear into the hearts of opponents as their blockbusting displays against Wigan Warriors last week suggested. It also begs the question: When will Thommo be asked to sign a new deal? The former Bold Miners youngster has been on Saints' books since the age of 11 and still has two years left on his current contract. But it would make sense if Saints offered him a new deal now - if they haven't already done so - and strengthen their hand in the long-term. One or two Australian clubs have already taken note of both his club and international performances and maybe he would like to follow in the footsteps of his hero, former Saints' prop James Graham, and try his luck Down Under.